The pictures above show the sari in the northern style and southern style. The first two pictures show the front and back view of a sari worn in the 'North Indian' or "Gujurathi" style. 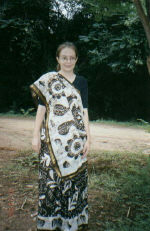 The third picture is a different sari worn in the southern style. These directions are given in comparison to the SOUTHERN style(SS). 1. First, to start, tuck the sari in the opposite way. In SS, to start you have to tuck in the right side, with NS, you tuck in the start in the left side of the underskirt. 2. Continue wrapping around waist to the right, and tuck in underskirt. On the second wrap around, take the pullu and pleat it and pin it on your LEFT sholder with pullu coming on the chest. This is unlike the SS where it goes over the right shoulder. In addition, put a pin in under the blouse and pin the pullu on the right above the breast, so it doesn't fall down. 3. 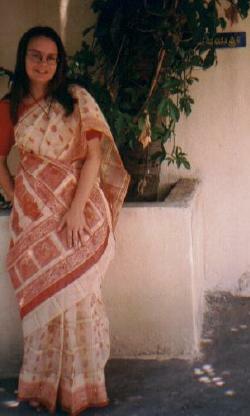 To pleat the front of sari it is opposite to the SS. For NS, you have to pleat with folds facing to the right, and tuck in the same way. Tuck in with pleat folds facing right, unlike in SS where they face left. 4. When finished, take the left side of pullu and tuck it in the back of the underskirt, as the back view shows. Usually women, especially elder ones won't wear the sari like this, they won't pin the pallu, just keep it and put it over the head. Some elder women in North India may just cover their head and not their chest. That is mostly the village women, as city women who do wear sari, cover their chests. 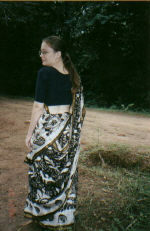 This sari style is not really worn in the south because as it is seen it is very revealing, especially in the back. IT is also harder to keep the chest covered, especially on the left side, when bending down. Please becareful and wear with caution. It is considered highly vulgar to reaveal your blouse in the front as it is considered as a 'bra' to some. 1. It is easier to wear, not so hard to keep in place. 2. To me, it just looks more elegant and neat. 3. If not careful, the back part with hangs down in the NS, can get caught and when sitting down it is harder because you have to arrange it, so it doesn't feel 'tight'. This page has been visited times since it's creation: September 15, 2001. Return to Jen's Home on the Net!